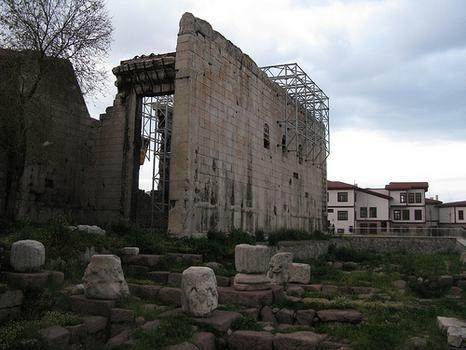 The remains of the Augusteum or Temple of Augustus and Rome can be seen here. The remains of the Augusteum or Temple of Augustus and Rome can be seen here. Constructed on a sacred site dedicated to Phrygian Goddess Cybele between 25 - 20 BC after the Roman conquest of Anatolia , it symbolized the loyalty of Galatia to Rome with the Res Gestae Divi Augusti inscribed on both walls inside the pronaos (covered passageway).